Four Horses has announced that Miles & Kilo will land on Nintendo Switch on 5th July. A long-awaited sequel to the popular Kid Tripp, Miles & Kilo aims to offer the same charming retro appeal and challenging gameplay, but is now re-vamped with new mechanics, bosses, and a trusty sidekick. The game allows you to choose between two play-styles, either as a regular platformer to take time and be precise, or as an autorunner to aim for the fastest times possible. - Super challenging, fast- paced platforming action. - Silky smooth 60 frames per second. - 36 formidable levels across five detailed worlds. - Video capture and HD rumble on Nintendo Switch. - Gorgeous hand drawn pixel art and charming retro soundtrack. - Two super adorable characters with unique abilities. To celebrate, Four Horses has revealed two genuinely impressive offers for anyone wanting to buy the game at launch. 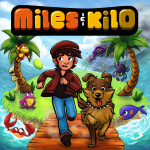 Players who don't already own the game’s predecessor, Kid Tripp, will get the prequel completely free of charge when they buy Miles & Kilo through a 100% discount on the eShop. For those who already own Kid Tripp, a 50% discount will be applied to their purchase of Miles & Kilo at the Switch eShop checkout. Both of these offers only run until July 12th, so don't hang around! The game's standard price is set at $7.99 / €7.99 / £7.19, but we'd recommend taking advantage of the deals above if possible - we enjoyed Kid Tripp when it originally launched on Switch and 3DS. Make sure to throw us a comment below if you're interested in this one - and remember that these pre-order deals end on 12th July! Eh, not really my kind thing but cool for those who like it I guess. I think I'll get it since it's 50% off. I enjoyed Kid Tripp and this one seems to have a lot of new stuff. Just went almost to the end of checkout and no 50% discount, anyone know whats up? Nevermind, the discount is at LAUNCH lol. This article is slightly misleading cause they reference "preorder deals" at the end, but no worries. @Fake-E-Lee What region are you in and do you already own Kid Tripp on Switch? @ImDiggerDan I'm in the USA and I do indeed own Kid Tripp (love it too, great little game and I can't wait to get into this one)! Kinda bummed, I was hoping to preorder this one so it would hit my Switch a little faster while I was on vacation with sketchy WiFi but alas, doesn't seem to be in the cards. First world problems I suppose. This looks awesome! You've outdone yourself. @Fake-E-Lee I'm not sure why it isn't working for you, it should be. When I looked on the Euro eShop earlier, it showed the 50% off tag in the search results. I'll look into things a little more. Can anyone else who owns Kid Tripp in the Americas please check the eShop to see if it shows the discount for them? $7.99 for two games? I'll bite. They look cute. For some reason, I find the dog's Sonic-esque homing attack to be very funny. Ok, it looks like this is not active in America yet, I'm chasing this up with Nintendo right now. @ImDiggerDan Good deal, thanks man. Let us know what you find out, I just put it together that you're the dev lol, I just thought you were a helpful fan until a minute ago. @Fake-E-Lee I'm trying to get this sorted with Nintendo as soon as possible. When do you go off on holiday? Also, I suspect you won't be able to unlock it when the time comes without an internet connection, will you have one? @ImDiggerDan I'll be on vacation until 7/7 and I'll have internet, it just might not be the greatest. I may end up waiting for launch though, if the preorder discount doesn't end up working I'll just wait. No biggie. @Fake-E-Lee I believe it should be now working. Can you please check and let me know? Also, thanks for brining this to my attention in the first place! Is there online leaderboards on either ? On titles like these I like to have leaderboards to chase for me it's about the replayability, they both look like fun pick up and play titles. @ImDiggerDan No worries man, like I said...I was just a guy talking in the comments and I had no idea you were the "man behind the curtain" lol! No problem though man, always glad to help and I'll go try it now! @Fake-E-Lee I have just had word from another source that it is working! Excellent stuff. Do you happen to own a 3DS/2DS and if so, do you have Digger Dan DX for it? @ImDiggerDan Just did it man, super stoked to play it on launch day! Really appreciate the dialogue, this site in particular is really great for this and I love when you guys (devs) jump int. I'm a Switch only guy, in a 2 Switch house (me and my wife) so we don't have a DS system. You're just gonna have to port it to Switch man. Love the discount for Kid Tripp owners!!! @Fake-E-Lee Contact me via my website, please. www.fourhorses.co.uk Once you send the mail, post something on here so I can be sure it is from you! @Romeo-75 No online leaderboards, I'm afraid. I would like to add them in the future, but I can't make any promises at this time, I'm far too busy on the other console versions. @Magrane I'd love to make it apply to 3DS, in fact I wanted the 3DS and Switch versions of Kid Tripp to support cross buy, but unfortunately it is not possible. @bezerker99 Yeah, I didn't like the idea of existing owners of Kid Tripp getting no loyalty reward when we decided to give KT away free with Miles & Kilo. This way their discount amounts to the original cost of KT, so they pretty much get it free the same as new players. @ImDiggerDan Sure will man, first thing in the morning when I’m back in my office! what is it with this 2d hype. @ImDiggerDan, Thanks for the response, I plan on getting both titles with such a good deal for getting both available. @ImDiggerDan Ah, I’ve been good about saving my Gold Points, but this a good deal and I can’t pass it up. Just prepurchased! Wow! I actually impressed by the graphics and character design. Looking forward to playing it. It looks fun and pretty darn cool to play. This is the whole reason I bought a Switch! Very nice model for a launch discount. @ImDiggerDan Hey man, just sent you an email via your website! @ImDiggerDan Thank you for pointing it out! No worries on my end though, I will be supporting your release! And I own Digger Dan DX on the 3DS - congratulations on a job well done.